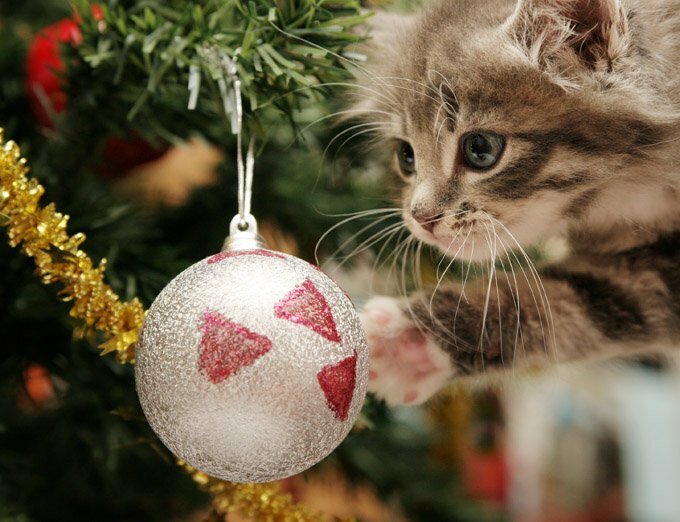 Watching a kitten climb the stem of a Christmas tree is undeniably adorable, but beware! Danger lurks, as well. The Holiday Season is fraught with peril for curious kitties who are easily overlooked in the commotion and rush. 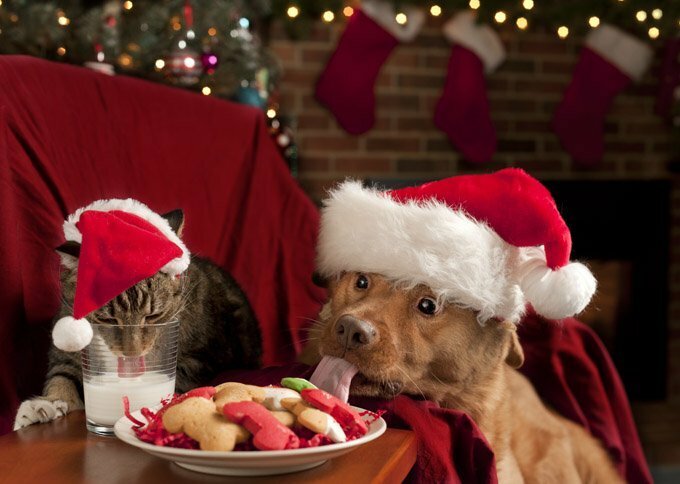 However, a few simple precautions will help to ensure your cats’ safety during the holidays. Christmas trees attract cats like magnets. Unfortunately, the Christmas tree harbors several dangers for inquisitive cats, as well as the potential for a big mess and electrical hazard if the cat knocks it down. The safest of all solutions is not to have a tree, or rely on a cat tree alternative. However, if you must have a tree, put it in a room that the cat can’t access. The next best step is to take precautions. Trees should be secured with a heavy base and guy-wires. Don’t let the cat chew on the electrical wires. You can prevent this by covering the wires or spraying on a bittering agent. Cats also don’t mix well with breakable ornaments. Avoid hanging crystal and other fragile materials from the lower branches. The same goes for any that could be swallowed. Valuable or cherished decorations should not be put on the tree at all. Tinsel is another no-no for cat-loving households. A cat could easily swallow tinsel and suffer intestinal blockage. Pine needles and preservatives or aspirin in the tree’s water can harm a cat as well, so needles should be swept up regularly, and don’t let cats drink the water. 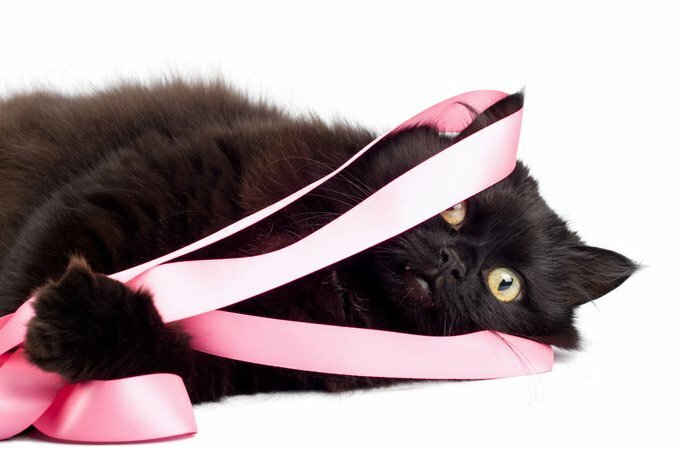 Ribbons on packages also call kitty’s name and present another danger for the digestive system. 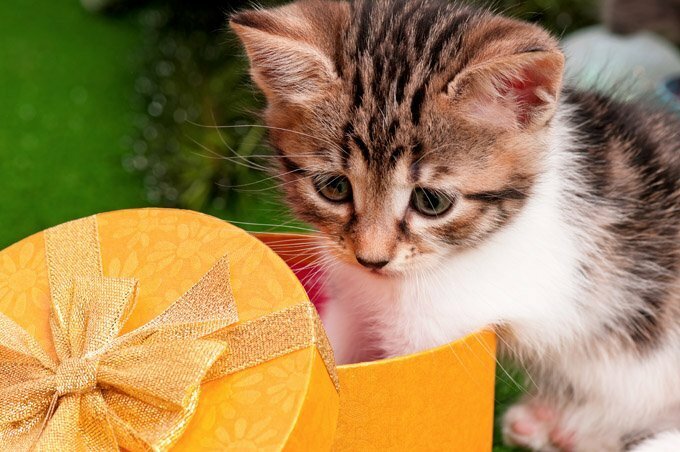 Since your cats are likely to play with presents under the tree, leave off the ribbon or keep the gifts in the closet. Put the ribbon away after wrapping gifts and clean it up after opening gifts. Some plants traditionally enjoyed during the holidays are poisonous to cats. 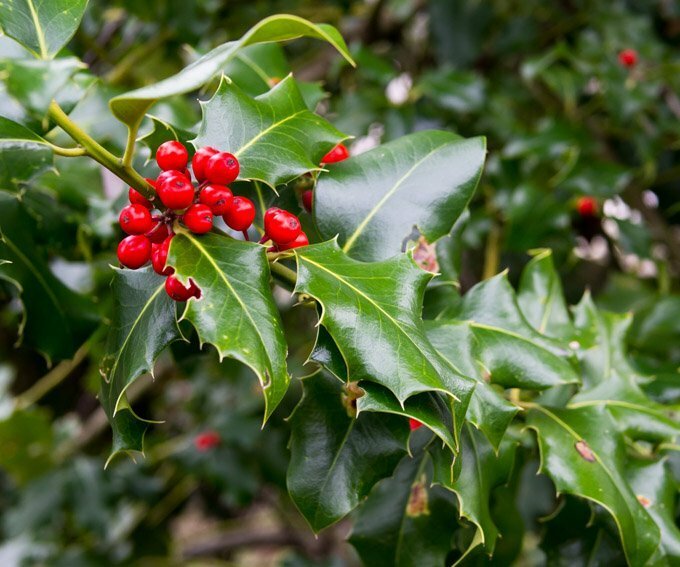 Those plants include, to varying degrees, mistletoe, holly, lilies, poinsettia, and paperwhites. These plants should be kept out of kitty’s reach or, better yet, out of the house altogether. Just as with Thanksgiving, cats should not eat table scraps from your holiday meal. Some foods like onions or chocolate will make them sick or could even kill them. Cats who are not accustomed to table scraps can get sick just from the change in diet. It’s best to stick with your cat’s normal meals and feeding routine to avoid upset stomachs. 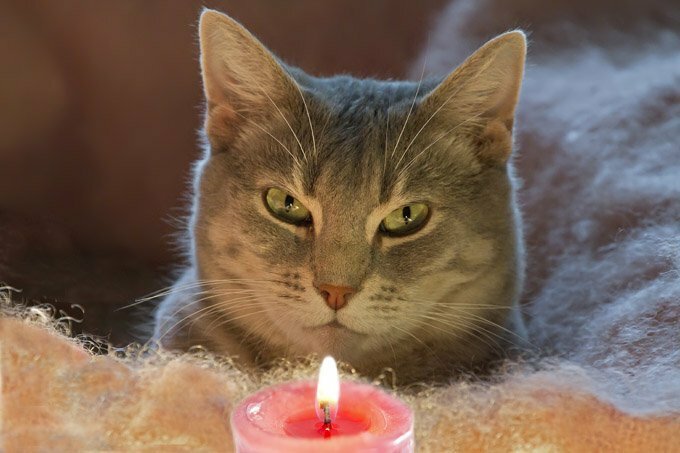 More than one cat whisker or paw has been singed over the years when a cat decides to inspect a candle up close. A flickering tail can also easily find its way into the flame of a candle or knock it down, potentially creating a fire hazard and a waxy mess. If you light candles, either keep the cat out of the room or watch them very carefully. BONUS TIP: The Good News: Free Gifts! Cats love boxes and crinkled paper and can have a blast “helping” to open presents and then playing with the wrappings (but not the ribbon). Keep your camera on hand! What other safety tips should cat lovers keep in mind around the holidays? 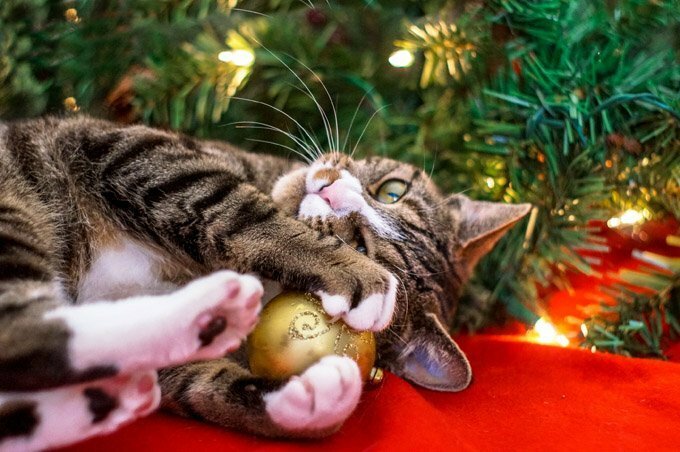 How do you keep your kitty away from the dangers of the Christmas tree? Let us know in the comments below!